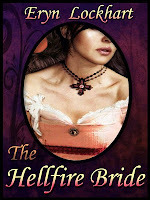 Ana Mardoll's Ramblings: Author Interview: Eryn Lockhart on "The Hellfire Bride"
Author Interview: Eryn Lockhart on "The Hellfire Bride"
Ana: Today we have Eryn Lockhart introducing her novelette, "The Hellfire Bride". I haven't read this book myself, but Eryn was kind enough to agree to guest blog about her book to any readers who might be interested in the subject. Eryn, how would you describe your novel to your prospective readers? In broad terms, what is your novel about? Eryn: It's a sensual tale of love and vengeance set in Regency London, where a hero's quest to avenge the woman he loved and lost leads him to the darkest underbelly of Society, and the heroine who can make his heart whole. Eryn: It explores the flaws within a society and justice system that blames the victim for sexual assault or misconduct; in addition to examining how sometimes love strikes in even the most unexpected places, and motivates people to do extraordinary things. Eryn: I wanted to take readers beyond the ballrooms to some of the darker issues plaguing the Regency period... I do love the era, but I think that sometimes the more vile aspects are left out. I also have a personal interest in the subject matter as a survivor of sexual assault. I've had people blame me for my attacker's actions, or somehow think that I was tainted or my worth was lessened as a result of my experience. It's a sad reality that the idea that a person's worth can be ‘compromised' is still around in the modern age, and I wanted to write a story featuring heroes and heroines who'd come up against that ugliness and triumphed in the end. I love writing, and I love writing romance in particular -- it's my way of affirming that hope survives, love exists, and heroes are real, even in the darkest circumstances. Eryn: If you like historical romances written by Judith McNaught, Teresa Medeiros, Elizabeth Lowell, or Betina Krahn, chances are you'll enjoy my books -- they tend to feature strong heroines and heroes, witty repartee, more than a little humour, with just enough adventure, danger, and passion to keep you on your toes. I will occasionally dabble in darker subject matter, but the driving force behind my books is exploring the timeless enchantment of falling in love. Eryn: The Hellfire Bride is my first novelette, and is the prequel to a series I'm thinking of calling Hell's Belles -- featuring dynamic Regency heroines who've run afoul of Society's conventions, and the heroes who love them. My debut historical romance novel is After Midnight, an epic tale of desire and intrigue set during the early Napoleonic Wars and Regency. Like "The Hellfire Bride", it goes beyond ballrooms, but it takes place on a much grander scale. After Midnight sweeps readers on a whirlwind adventure from the French Revolution to London's underground, to the front lines of international espionage and a path to true love that goes hand in hand with a mission that can make or break an empire. I'm also working on a contemporary romance, urban fantasy romance, and another regency -- I'm hoping to have two new titles released before the end of the year, but which two it will be is anyone's guess. Eryn: The Hellfire Bride is available via Barnes&Noble, Amazon, Smashwords, and AllRomanceEbooks for $1.25. I love hearing from readers, and welcome any opportunity to chat with you, answer questions, or hear your thoughts. I can be reached on Twitter @Eryn Lockhart, my blog, facebook page, or Goodreads profile. Ana: Thank you, Eryn. I understand you have the first chapter of your novel available as an excerpt for interested readers? And is there anything else you wish to add for our readers? Eryn: The first chapter of The Hellfire Bride is available on my website here. My website also contains free excerpts of all my books, sneak peeks at current works in progress, information on monthly free ebook giveways, author interviews, and more. It was a pleasure to be here today, and thank you for having me.